Sunday's adventure was inspired by the $17 ticket prices I found online. The 27th was also Landen's original due date so we ran with that significance to continue his birthday celebrations. With but a week to go until the start of school, we've been doing our best to make the most of it. 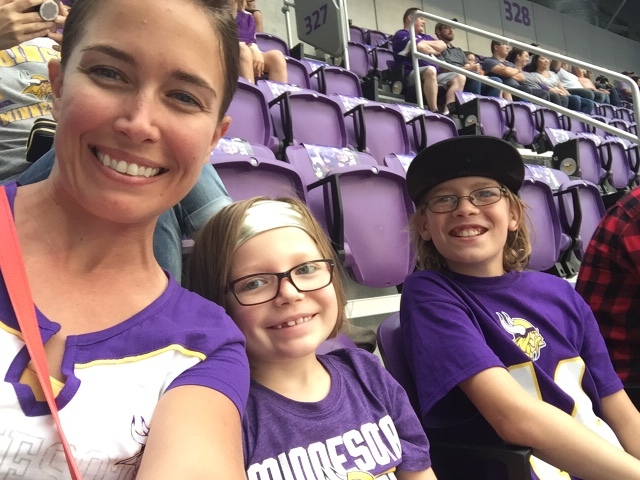 I told the kids we'd get to the stadium early to check it out before the 7 p.m. kick-off. 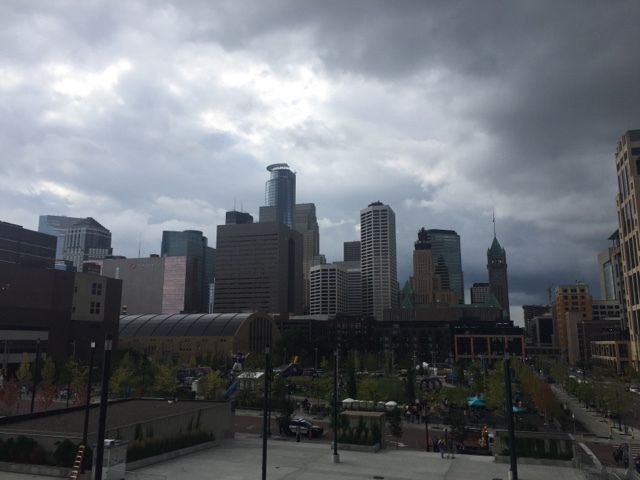 U.S. Bank Stadium is the new home of the Minnesota Vikings, and quite the addition to the Minneapolis skyline. In February 2018, Super Bowl 52 will be played here. 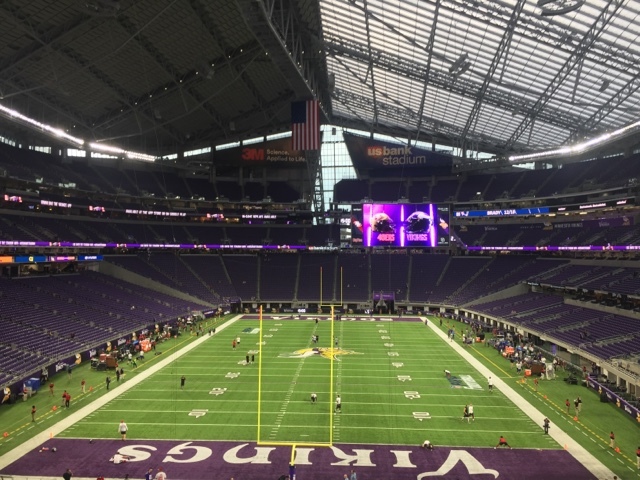 It was built on the former site of the Metrodome, which if you recall, the roof had collapsed prior to its closing in 2013. Before playing at the Metrodome, the Vikings played on the site that is now the Mall of America in Bloomington. This fixed-roof stadium was opened to great fanfare in 2016, having been deemed "construction complete" 6 weeks before the official ribbon cutting ceremony. The total budget for the project was $1.061 billion, and I have to say, it's evident. 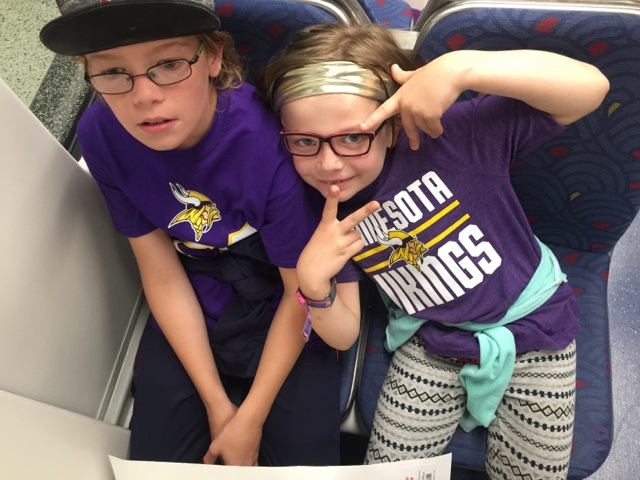 The kids and I took the Light Rail into town. And Landen is especially excited to have football back in his life. He doesn't seem to latch onto a team in particular, but rather, follows the careers and stats of certain players. 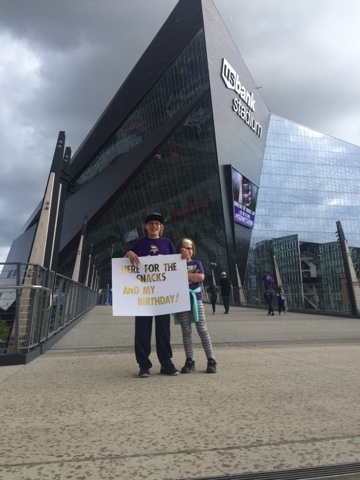 All afternoon and into the evening, he informed his sister and I of these facts and announced his prediction of who'd play here in the Super Bowl (Seattle vs Patriots). We were in section 327, right above the entry tunnel, and we had quite the perspective of the field and the game itself. Though Landen wished to have a closer contact with the players, I do think you're able to see a lot more when positioned here. 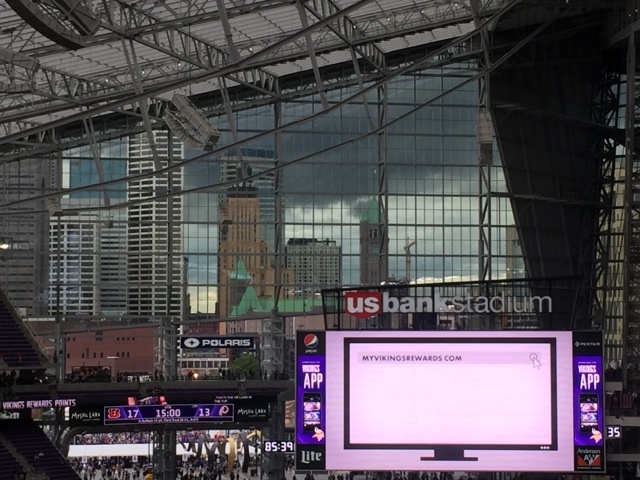 I love that the Minneapolis skyline is visible through the windows. Officially, this is the 3rd NFL stadium I've been to but my first NFL game. It was an exciting one at that - the Vikings rallied in the final seconds to win by 1 point. It was made extra special that I was able to get this one-on-one time with my kids. We knew plenty of friends had made their way to the game as well, but we mostly played it by ear. Three moved seats closer to us for a quarter, but unfortunately we weren't able to meet up with another couple before the game ended. It was more crowded than I expected for a preseason game, but considering how impressive the stadium is, I can certainly see the appeal whether you're a fan or not. If I can secure cheap tickets again for a future home game, we'll be back.